If you want to not only see the water from your villa but be able to step right into it, you’ll love Beach Court Villa. Shoal Bay is a great beach for families because it has restaurants and activities for adults, teens, and kids. The water is super calm too, perfect for kids or anyone who just wants to relax. Beachfront at Shoal Bay East! 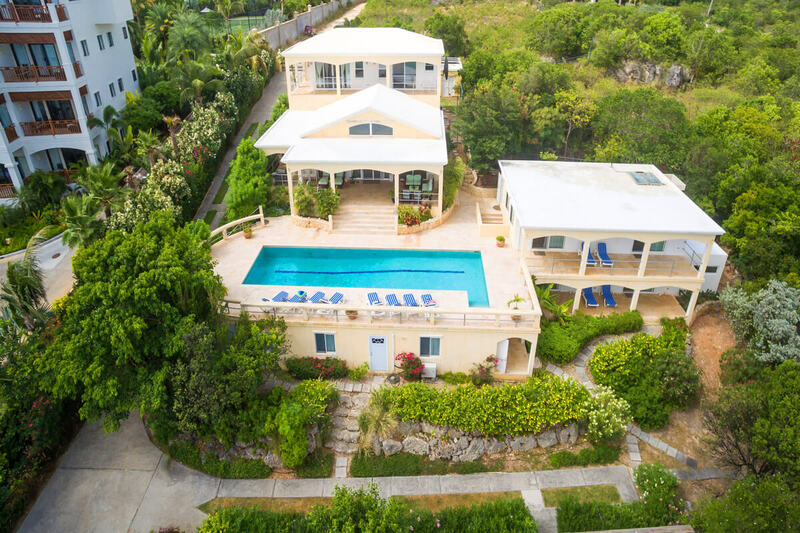 Beach Court Villa is a 10,000 square foot luxury home on Shoal Bay East. It sits in a gated community and offers eight air-conditioned suites, outdoor entertainment, and easy beach access. This villa has something for everyone. Guests can walk straight to the beach to go snorkeling amongst coral reefs, pick up the villa’s tennis rackets and balls for a match on the court, or swim in the rectangular pool in the center of the deck. Down on the beach, there’s chairs and vegetation for privacy. There’s a deck and bar by the tennis court so guests can take a break to sip some iced tea or rum punch. Loungers surround the pool for sunbathing, stargazing, and relaxing. Barbecue on the gas grill or cook on the charcoal burning cooker. Built on a hill, the house sits about 40 feet above the water, maximizing views and breezes. A step above the pool deck, there’s a veranda with shaded dining and living areas. Sliding glass doors lead into the Great Room, which encompasses the living area and kitchen. The living area has a flatscreen TV, wicker seating, a wet bar, and a telescope. A dining table sits adjacent and seats 8. The kitchen has an open layout, with a breakfast bar/prep island in the center, a docking station, standard appliances, and two coffeemakers. Ceiling fans run throughout for guests’ comfort, and there’s a DVD, CD, and book library for entertainment. The main house has three open, easily accessed levels. Upstairs, there are two master bedrooms that each have a queen bed, walk-in closet, and balcony access. One of the master baths has a shower, outdoor shower, and dual vanity. The other bathroom has a shower. Off the entrance foyer, there’s an air-conditioned study with a queen sofa bed and an ensuite bathroom. A separate two-story wing is joined to the main house via the large pool deck, and it houses four queen suites and and a kitchenette. Each of these bedrooms has an ensuite bathroom and terrace access. There’s also a queen suite in an apartment at the tennis court level that has an ensuite bathroom with an indoor and outdoor shower. All bedrooms are air conditioned. Daily housekeeping and laundry service will maintain the villa so guests can truly relax. Shoal Bay has several restaurants and water sports for guests to check out. It’s only a short walk or drive from Beach Court, and it has calm waters thanks to the coral reefs just a few yards from shore. Just steps from Shoal Bay Beach down a grass/sand path. Taxi driver will meet you and drive you to the villa. If you have rented a car, it will be delivered to the villa.